The 2017 National Football League (NFL) season officially starts on September 7, 2017 until the end of the year. High School and College football seasons, which are arguably just as huge, start a little before that. This means if you are a marketer looking to cash in on this lucrative season to market to the millions of football fans out there, your preparations need to start as soon as possible. Getting the right marketing promotional tools may take a little planning to decide on the best possible promotional products and finding nice electronic copy of your company logo and even a possible message or tag line to go along with it. The best promotional product for football season is needless to say, personalized footballs bearing a company logo or design or even photograph along with some sort of a short text message you want your fans to see. Nothing pleases football fans and your client base more than receiving a football souvenir custom printed with your brand name as a memorabilia for an unforgettable and adrenaline filled football season! 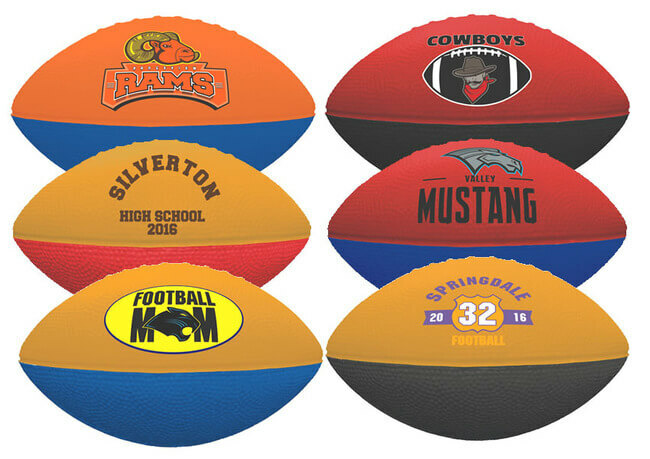 Although a good majority of our clients are marketers using custom footballs for promotional purposes for events during football season, a large part of our customers also use these printed footballs for other unique purposes such as family reunions, birthdays, bah mitzvahs, charity fund raising, weddings, graduations, souvenirs for high school or college football team players and coaches, etc. For people who are football fans, having a football themed event on their special day will certainly light up their eyes and put a smile on their faces! And here at Promotion Choice, we can help you easily fulfill your customized football giveaway choices with our large inventory of promotional football styles, colors, and sizes. If you visit our printed footballs page, you have over 22 choices (and ever growing) of logo footballs for you to choose from. Perhaps you want to throw out footballs into the crowd? Get one of our personalized mini footballs in bulk in plastic, vinyl, or even foam material (these come in a big array of colors). Any of our custom foam footballs, printed mini plastic footballs, or customized mini vinyl footballs are lightweight and soft, and won't hurt anyone in the crowd when thrown. Maybe you want realistic looking personalized footballs but don't want to break the bank – select our super economical rubber custom footballs. If you prefer real footballs, we have plenty of choices for you too with our imprinted synthetic leather footballs or our high end genuine branded Wilson footballs. All of our monogrammed footballs can be printed with either spot colors or many can also be emblazoned with a lovely full color picture or photograph. If you are a high school football coach for example, imagine your team players' reaction if you order custom signature footballs for them each printed with a nice high resolution photo of the football team! They will go wild with excitement! 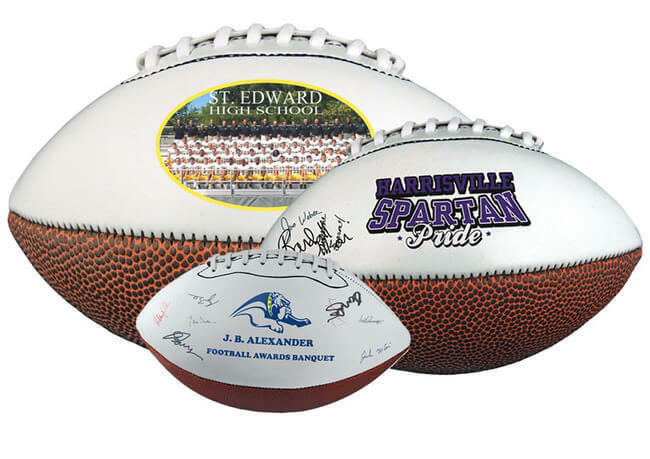 Our personalized signature footballs also have two white panels – one which allows for a logo or photograph to be printed, and the other panel can be used either for collecting signatures or printing of the entire roster of names for the football team. This makes a fabulous souvenir and we have had so many hundreds of positive feedback from happy coaches on these printed autograph footballs. 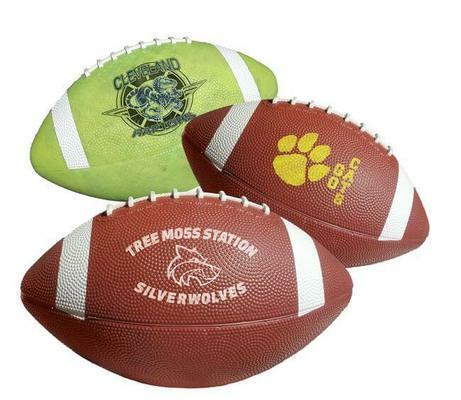 All of our personalized footballs can be spot printed – this means your logo can be printed with either one, two, three, or four spot colors (no gradients and shadings). One color spot printing is the standard, the most economical method of printing and is what at least 80% of our customers choose to do. Most of our smaller custom mini footballs can also be printed with full color direct printing method. This means that a full color photograph can be beautifully printed onto these footballs and they are printed directly onto the football without the use of any decals. Because of the size of mid-sized or full sized branded footballs, these do not allow for full color direct printing. Instead, if a full color photo is needed for these products, the full color logo/photo is printed onto a decal first, and the decal is then professionally and permanently adhered onto the football. The end result is a beautiful monogrammed football, and most of the time, you won't even be able to tell its a decal unless you are examining the ball very closely. Whatever the print method, our printed footballs are always high quality, and the print result is always spectacular! Get Ahead, Start Preparing Your Custom Football Order Now! Which football can I get based on my budget? What style will best suit my event needs? What color football should I get based on my event theme? If I am doing spot printing, what color(s) ink should I use? What tagline or text message should accompany my logo or photograph? Once you have answers to the above, get a high resolution electronic copy of your logo or photo and place your order of promotional footballs in bulk directly on our website. It really is that easy! If you feel more comfortable talking with one of us about placing your order, call our hotline in our contact us page, and we are standing by to assist you in anyway we can from answering any questions to artwork or even design help! We are very good at what we do!